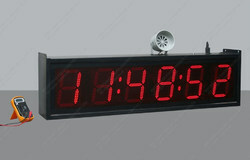 GPS clock systems do not involve the use of complicated equipment in order to work. They areeasy to install and can be installed in a number of different locations in the school, hospital orother business that uses them. Should the electricity ever go out due to inclement weather, thesystem will continue to perform accurately. This is due to the technology that stores data in a nonvolatilememory from the instant the power goes out.When it comes back on, the transmitter will receive the time from the GPS receiver. It thencorrects any of the internal data and will send the updated time to system clocks. Any type ofpower outage that is not extended beyond a reasonable length will not have a significant impacton the accuracy of the GPS clock systems. We also provide Slave NTP Clocks and NTP Servers with GPS Syncronization. 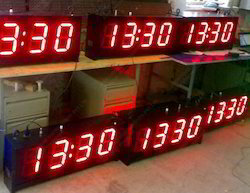 Following are the main clocks which we provide under this category. 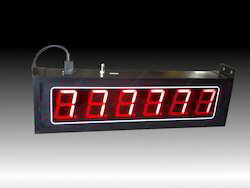 GPS Clock for use in various places such as offices desks, Lobbys to buses and cars. Useful for showing speed when mounted in automobiles. Optional time zone setting feature for displaying time of different countries. 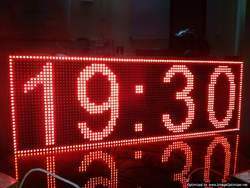 We are offering Time Zone LED Display World Clock to our clients.LED digital world time zone clocks to have Dot matrix LED's for time displays & vinyl sticker or again LED display with differential color for zone label below. More zones may be displayed than physically available by page flipping to another set of zones – For example, a 5 zone display can actually display up to 20 zones by page flipping through 4 setshh of zones. Selected zones can remain constant while other zones change. Dynamic digital lettering can include fixed titles and/or date, day, the day of the year, etc. We are offering GPS Clock to our clients.